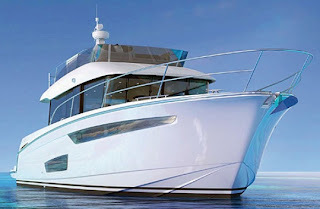 Jeanneau presents the Tony Castro designed project for the new 42 Voyage, set to be unveiled at the end of 2012 at the Paris boat show. This Jeanneau 42 Voyage project takes the French company to a new direction offering looks reminiscent of a trawler. Lets say the new Voyage will be the first challenge at least in the looks department to a known Italian firm as the hull and engines power seems more that of a planning boat. Not much details are given for interior space and layout but we do know that the 42 Voyage will offer two separate cabins. Power will be twin 380hp Cummins with line shafts which give speeds up to 28 knots. The 42 Voyage will also have a wide range of cruise speeds available upwards from 15 knots.